A few days ago, I discovered a new constellation -- I named it Water Strider. It’s located in a beautiful corner of the universe replete with star clusters and even supernovae. Of course, I’m referring to the water strider (family Gerridae). This amazing creature can walk on water. 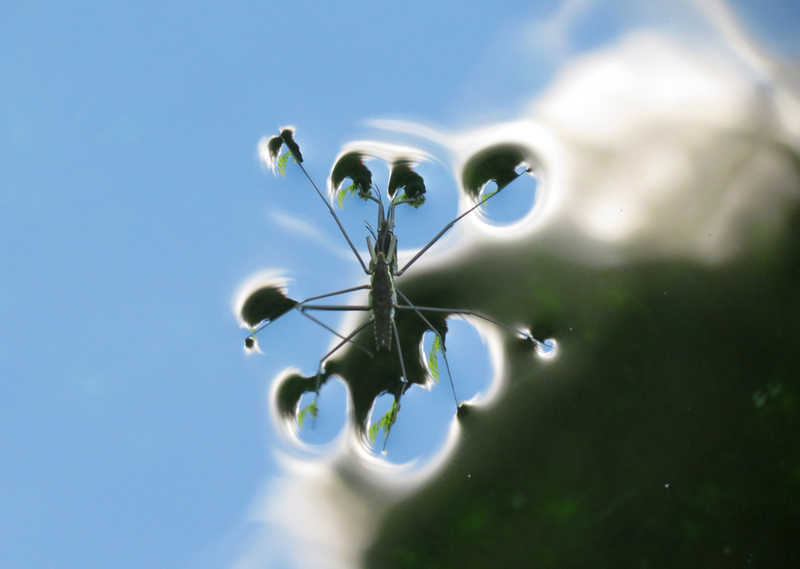 Surface tension, very long legs compared to body length and bodies covered with water-repelling micro hairs enable the striders to skim across the surface without sinking. As shown above, the sides of the depressed water surface dimpled by its legs act as tilted mirrors, beaming little images of the Sun to observers around the pond. Besides their miraculous motor skills, water striders are just fun to watch. Photo taken in late June 2012 while I was standing on a little bridge overlooking a pond in San Francisco, California. Photo Details: Camera Maker: Canon; Camera Model: Canon PowerShot SX40 HS; Focal Length: 150.5mm; Aperture: f/5.8; Exposure Time: 0.0040 s (1/250); ISO equiv: 200; Software: Adobe Photoshop CS3 Windows.